Since the beginning of civilization, architects have kept themselves primarily preoccupied with the buildings and structures here on planet earth. But with Elon Musk predicting that humans will reach Mars in 2025, perhaps it is time to consider architecture abroad—far, far abroad. What zoning requirements will exist on the Red Planet? What materials are there? What tools are needed? In short—what should we consider when planning for Martian architecture? The Hawaii Space Exploration Analog and Simulation (HI-SEAS) program is attempting to answer these questions. 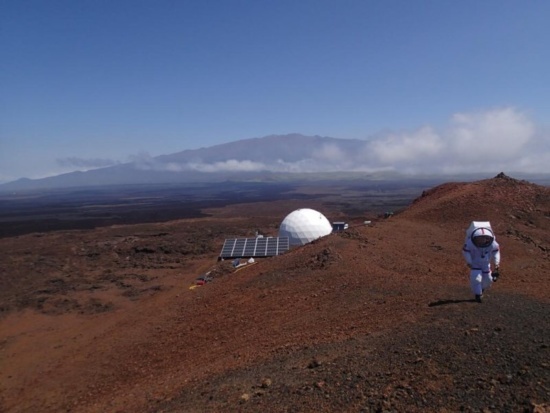 In August 2016, HI-SEAS concluded the 12-month Mission IV, NASA’s longest Earth-based Mars simulation. 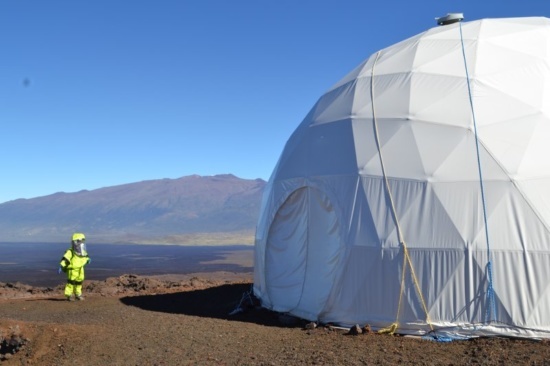 Funded by NASA and carried out by the University of Hawaii at Manoa campus, the program’s main focus is on behavioral research, particularly the psychological and psychosocial changes that would occur in the crew during these grueling, isolating missions. But along with that research, HI-SEAS also offers opportunities to study extraterrestrial architectural possibilities and how design can impact the quality of life to, from, and on other planets. The HI-SEAS habitat itself is a prefab geodesic dome by Pacific Domes International, an open concept design by Blue Planet Research. The structure has a habitable volume of approximately 13,000 cubic feet, which translates to approximately 1,800 square feet across the main floor, second floor loft, and a workshop in an adjacent 20-foot-long steel shipping container. 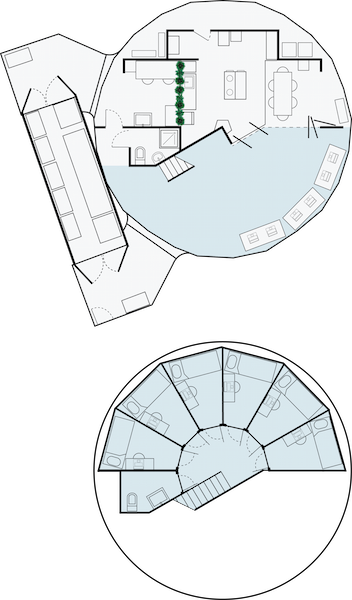 The double-height main living area contains a kitchen, laboratory, bathroom, simulated airlock, storage unit, dining room, public area, and telemetry room. On the second floor are six bedrooms and a half-bath. A 10kW solar array on the building’s south side and back-up hydrogen fuel cell generator provide energy; a propane generator can be used in the event both systems are down. Water is stored in two 500-gallon potable water tanks (refilled once a month or so), and waste water is stored in two 250-gallon gray water tanks. Superficially, this setup meets all basic requirements for the crew to survive and conduct research, but as Mission IV architect Tristan Bassingthwaighte discovered during his year-long tenure there, it does little to address the entire scope of human needs. “While it is nice and spacious and open, the actual programming of the habitat and the amenities inside are far from ideal in keeping a crew happy and productive,” he said. According to Bassingthwaighte, one major issue was the lack of soundproofing and privacy. 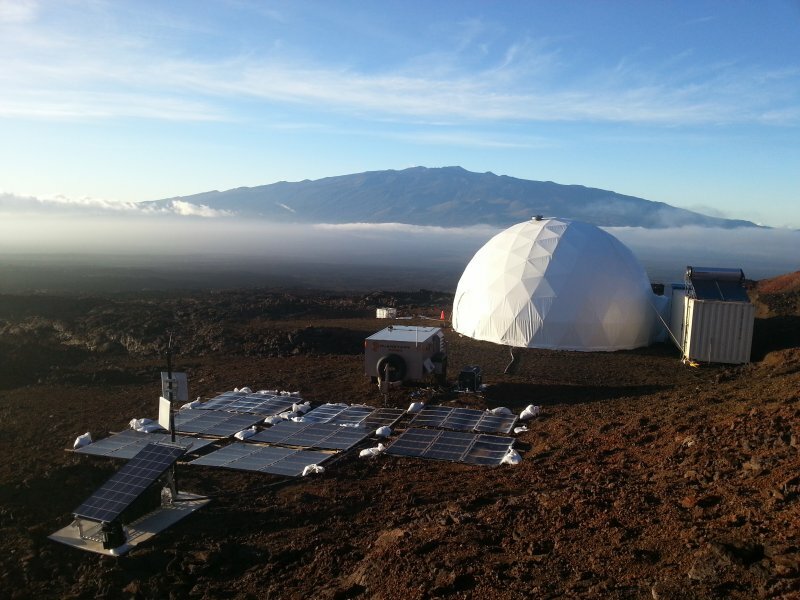 To be low-impact and semiportable (important factors when building an initial base on another planet), the habitat was constructed from lightweight materials such as canvas and plywood, which do little in terms of acoustic mitigation. In their efforts to find privacy, team members attempted to seek refuge in the airlock (the only semiprivate space), but other teammates were constantly walking through the space. So, in case spending a year with the same six people wasn’t enough of a challenge, they could also hear each other 24/7—a guaranteed method of irritating basically everyone. Addressing these two concerns are fairly straightforward—Bassingthwaighte redesigned the interior layout to improve the sense of privacy, create additional semi-private areas, and include more flexible lighting options. This was done through minor program changes and introduction of soundproofing materials and more natural LEDs. But to truly address “the sum of human needs within the space,” Bassingthwaighte and other previous crew architects had to get more creative than that. They concluded that a 3-D printer would be a crucial tool to help reduce the need for spare parts, solve unanticipated issues, and, ultimately, to allow newly settled Martians to build their homes and cities. During actual space flight, 3-D files can be made by designers on the ground and simply printed by the astronauts, who are otherwise occupied with the spaceship; but once crew members have reached their destination, anything can be printed as needed (provided there are a few space architects and designers on board to create the files). And, until we make it to Mars and start to build cities there, working with a different climate, topography, and gravitational force, human-centric design is our best bet for buildings on Earth, too.